Mod for new updates notification. – Karma Mod. Karma collection – on damage in 1k or more, or the explosion shels shout Skadoosh!. And when you need to rule battle – activate karma via shout Fus-Ro-Dah!. – Russian radio Wargaming.FM – listen to the radio and rule battles! – – – Complex XVM with many features, include hangar carousel. – Panel of damage – with advanced statistics and counter of recharge the last enemy. – Indicator of direction where shall come to you with counter. – Sniper sight up to х30. – Zoom mod (camera for commander), camera stabilizator, free camera in replays via CapsLock+F3. – Horizontal angles indicator for Tank Destroyers and SPG. – Count panel and overall HP of teams. With count of damage to the Main – – — Caliber medal. – Display nearby enemies. Red – can shoot at you; Green – can’t. – Statistics for the game session – the number of victories / defeats, profit etc. – Automatical activator for Personal Missions with a choice of difficulty. 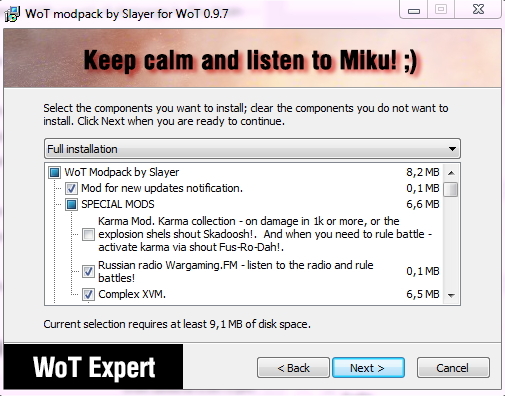 It is recommended to install together with the mod calculation Hangar experience and fighting until the next tank. – Calculation Hangar experience and fighting until the next tank. – Pop-up window when you hover on a tank with a dynamic change in the characteristics. – Advanced crew private matter. Shows how much experience and fighting left up to 100% skill. Setup on ENG but every text in game RUS. Cmon, write if its only for russians.